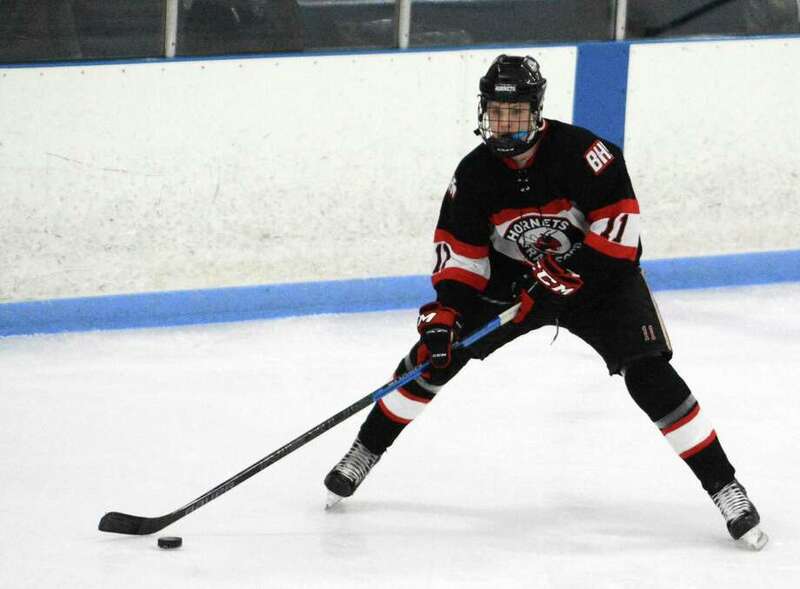 Jack Manware and Branford will face off against Glastonbury in the Division II championship game on Monday at Ingalls Rink. ROCKY HILL — This is the time of year when a hockey team’s depth comes to the fore, when a third forward line or a third defense pair can mean the difference between glory and a quick exit from the CIAC Division II boys hockey tournament. But take Branford (18-3-4), the fourth seed, going into Monday night’s final against sixth-seeded Glastonbury (14-8-2). The Hornets are unbeaten in their past 11 games, won the SCC/SWC tournament and have outscored opponents 15-4 in three state tournament games. They typically run seven forwards and four defensemen. But they somehow feel deeper. “I think, unlike other years, any of those players can be dangerous on any given night,” Branford coach Jim DiNapoli said Thursday at the CIAC’s media day. “If a couple of the guys have off nights, where they’re not contributing on the scoreboard, they’re certainly contributing other ways, and other guys can pick them up and score. Branford is looking for its second state championship, while the Tomahawks seek their third. They’ll meet Monday at 7 p.m. at Ingalls Rink. The only game Branford hasn’t won in regulation in the past 11 was the SCC/SWC semifinals, in which it came from 4-1 down to tie Guilford, then won in a tiebreaking shootout in lieu of overtime. Its last loss, a 3-0 setback to Conard on Feb. 1, stung. “We all argued that game. We had nothing going. We just let them beat us,” senior forward Max Bunton said. It’s a bit like Glastonbury, whose midseason lull dropped the Tomahawks to .500 with a 5-1 loss to Simsbury on Feb. 11. “It’s a long season. We’re together each day, four or five hours — we take a bus to practice together, we take a bus back from practice — we’re a family. Sometimes families get tired of each other,” Glastonbury coach Ken Barse said with a laugh. And it does, a long grind from the first game of the year, Dec. 12, when Glastonbury came down to Northford Ice Pavilion and, in a game that Barse said opened his eyes to what his team might do, beat Branford 4-0. “It’s fun that it’s the first and last game of the season. We hopefully get our revenge,” Bunton said. It took a while for the message to sink in that the Hornets would have to work together, but it got there after that Conard loss, and now they’re in the school’s third Division II final. At media day, Branford had one table in the ballroom, and the Tomahawks had another. One table separated the teams, and sitting next to each other against the wall at that table: the coaches, who’ve known each other for about 20 years through former Branford coach Adolph Brink. They’ll stand behind benches on opposite sides of Ingalls Rink on Monday night, a long grind from that Wednesday night in December.